Hellerup School is a distinctive example of an innovative school designed for 21st century learning. The school is – as the only school in the SKUB project – built from new. Its ground-breaking design is based on personalised, agile learning spaces, entirely without classrooms. Students are organised in form groups, sharing home areas with two other form groups, – areas that cater for multiple ways of learning, working and enjoying school life. The teachers work mainly in teams and collaborate with students to plan their learning. Lene Jensby Lange was charged with finishing the last tiny bits of the building project and led the 1 year review of the building. Moreover, she led a user-voice process to tweak and fine-tune particular learning spaces to actual needs. 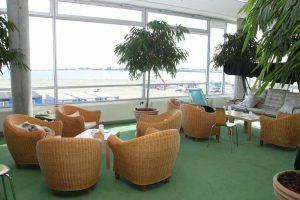 This resulted in an adjusted welcome area and a new staff area designed as an inviting “palm beach” with Niels Ole Sørensen (JJW Architects at the time) as the always creative architect.